The weekend weather will be windy, rainy, chilly with some welcome sunshine on Sunday. The mixed bag forecast comes from the National Weather Service. 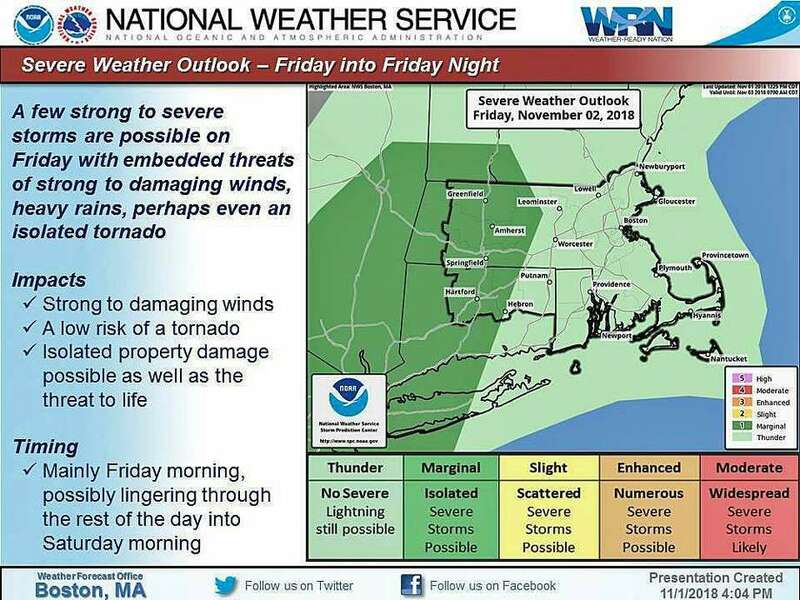 “A period of stormy weather can be expected through Saturday as a slow moving system tracks though the area,” the NWS says. The biggest concern is strong winds on Saturday that could bring down trees and branches and lots and lots of leaves. All of Connecticut has a High Wind Watch from noon to 8 p.m. Saturday. Wind will blow from the west between 20 to 35 mph with gusts up to 50 mph. Its hourly forecast has the strongest wind gusts between 2 and 4 p.m. The best chance of rain on Saturday is in the morning with clearing and some sunshine in the afternoon. Sunday is the best day for outdoor activities. Maybe, starting to rake those wet leaves blown down on Saturday. Today: Rain likely before 9 a.m., then showers likely and possibly a thunderstorm between 9 a.m. and noon, then a chance of showers and thunderstorms after noon. Some of the storms could produce heavy rain. Cloudy, with a high near 66. South wind 10 to 14 mph. Chance of precipitation is 70 percent. New rainfall amounts between a tenth and quarter of an inch, except higher amounts possible in thunderstorms. Tonight: Rain and possibly a thunderstorm. Some of the storms could produce heavy rain. Low around 54. South wind 7 to 9 mph. Chance of precipitation is 90 percent. New rainfall amounts between 1 and 2 inches possible. Saturday: Rain likely, mainly before 2 p.m. Cloudy, then gradually becoming mostly sunny, with a temperature falling to around 49 by 5pm. Breezy, with a west wind 5 to 10 mph increasing to 19 to 24 mph in the afternoon. Winds could gust as high as 48 mph. Chance of precipitation is 70 percent. New precipitation amounts between a quarter and half of an inch possible. Saturday Night: Mostly clear, with a low around 36. West wind 8 to 16 mph, with gusts as high as 32 mph. Sunday: Sunny, with a high near 52. Northwest wind around 6 mph becoming calm in the afternoon.